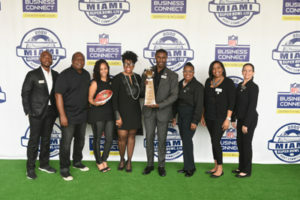 MIAMI, FL – March 18, 2019 – Hundreds of business owners gathered to network and understand what it takes to do business with the National Football League (NFL) when South Florida hosts Super Bowl LIV in 2020. In its final session to reach Miami-Dade County disadvantaged businesses & suppliers, the Super Bowl LIV Business Connect program sponsored an informational session on Saturday March 16, 2019 at Florida International University. 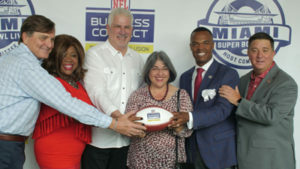 The Businesses Connect team works in partnership with the Miami Host Committee to create opportunities for experienced, qualified and certified business owners to compete for contracting opportunities related to Super Bowl LIV while encouraging NFL contractors, partners and primary suppliers to source products and services from local suppliers. The most requested vendor categories are as follows: audio/visual, barricades, cable & networking suppliers, carpet/flooring, catering food & beverage, courier services, decor, entertainment, equipment rentals, event staffing, fencing, event production, and more. This event was produced by Hip Rock Star who worked over time to pull together this unforgettable experience in less than 10 days. Women, minority, LGBT or veteran-owned businesses showing 51% ownership by the designated minority classification. Businesses must have been in operation 3 years or more as of May 24, 2016 in Miami-Dade, Broward, and Palm Beach counties. Businesses must be experienced, certified, and in good financial standing. Businesses must be direct source for the work they compete for and or contracted to perform. Businesses must be located in the Tri County area: Miami-Dade, Broward, or Palm Beach County. Businesses must have the capacity to deliver the premiere-event goods and services needed to help NFL contractors produce their Super Bowl events. The online vendor registration deadline is on March 29, 2019. The vetting and selection process ends on April 30, 2019 with notification emails of acceptance and rejection to be sent out by April 30, 2019.